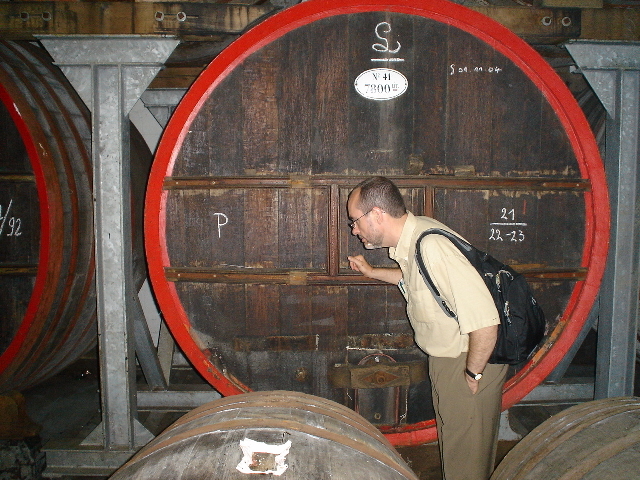 Owen Ogletree inspects an old Lambic barrel at the Boon Brewery in Lembeek, Belgium. Almost anyone who knows anything about beer will have the knowledge that wheat beers are a refreshing choice for the summer months. However, only beer connoisseurs are usually familiar with the most bizarre wheat beer in the world. These ancient Belgian ales are known as Lambics, and they are one of the world’s most idiosyncratic, complex, and elemental beer styles that are still commercially available. Lambics are produced only in a small region of Belgium known as Payottenland. These beers are produced without any additions of cultured yeasts, and fermentation relies solely on the microbes that reside in the atmosphere around Brussels and in wooden fermenting barrels. Lambics are usually dry, sour golden ales that contain only 4-6% alcohol by volume and are made with a large portion of raw wheat. Many Lambics are aged for months or years in wooden vessels. Sometimes Lambics from different years are blended (like fine wines) to produce a special vintage ale called Gueuze (pronounced GERZ). Often times there are additions of fruit and sugar. Lambics have the refreshing sparkle of a fine champagne and the earthy, oxidized character of a classic sherry – the best qualities of two of the world’s most appetizing drinks in one beer. Lambics are typically produced in rustic Belgian farmhouse breweries in the cooler months of the year. Disruptive yeasts of summer play havoc with Lambic fermentation. European malted barley and unmalted wheat are crushed and mixed with warm water to produce a sweet golden liquid (called wort) that is boiled along with aged hops. Most brewers use fresh, fragrant, green hops for maximum hop aroma, flavor and bitterness. Lambic brewers don’t want any of this in their beer, so the hops are aged for years to remove the flavors and aromas. The aged hops only add preservative acids and resins to the Lambic brews. The liquid is cooled in shallow vessels under open windows, and wild yeasts and bacteria settle into the wort overnight to begin the magic process of fermentation. The young Lambic is then transferred into large wooden barrels where fermentation and aging continues. Most Lambics are bottled unfiltered, and the leftover yeast consumes tiny amounts of residual sugar and builds up pressure and natural carbonation inside the bottle. This is definitely the “old school” method of beer production. As rare and archaic as these beers sound, there are many classic examples available in the Athens market. The most popular of which comes from the Lindemans Brewery in a small village just outside Brussels. Lindemans is famous for its production of popular, non-traditional, fruit Lambics that are pasteurized and sweetened. Their sweet, dessert-like raspberry Lambic (Framboise) is their biggest seller in the United States and is followed closely by versions called Kriek (with cherry juice) and Peche (with peaches). A more acidic version of an apple Lambic called Pomme has just hit the shelves of fine package stores in Georgia this spring. There is even a very interesting Lindemans brand that is combined with bold additions of black currants (Cassis). Because of their sweet nature, Lindemans’ beers are the best choices for people who are just beginning to explore the wild world of Lambics. In stark contrast to the sweet Lindemans offerings are the earthy, complex, intensely sour Lambics from Brussels’ Cantillon Brewery that was founded in 1900. Jean-Pierre Van Roy married a daughter of the Cantillon founder and took over brewing responsibilities in 1978. By refusing to pasteurize or sweeten his products for the mass market, John-Pierre has become known as a true Lambic traditionalist and inspiration for other brewers. Cantillon beers are carbonated naturally in the bottle by living yeast and exhibit a robust sparkle and thick foam when poured. Most fine beer stores in Athens and Atlanta will also have a supply of Cantillon’s Rose de Gambrinus Lambic that has a bountiful addition of tart raspberries (and a racy label with a painting of Gambrinus sporting a saucy lady on this lap). Cantillon Lambics are refreshing but deeply intense – definitely an acquired taste for many. The middle of the Lambic road is occupied by Frank Boon’s beers from Lembeek, Belgium. Frank Boon purchased a crumbling old brewery 30 years ago, and everyone thought he was insane. He is now one of the most popular Lambic brewers in the world and produces flavorful examples of Gueuze and fruit versions (such as his popular Kriek made with 200 grams of real cherries in each bottle and refermented in the bottle with no added sugar). The Boon Framboise beer is especially delectable and is packed with prominent flavors of fresh raspberries. Lambics typically are offered in 355 and 750-ml bottles. Most of them are corked like champagne and have foiled tops. To get the most flavor from your Lambic experience be sure to serve around 55 degrees Fahrenheit and pour slowly into a tall glass or champagne flute leaving an ounce or so in the bottom of the bottle (this keeps the yeast sediment out of your glass). Lambics are extremely complex (yet very refreshing) and make for a tantalizing aperitif beverage right before a summer meal of chicken, shrimp or fish. Beer lovers will say that a great Lambic will exhibit aromas and flavors of wheat, fruit, vinegar, sherry, leather, almonds, minerals, vanilla, oak and even horse blanket. Try not to be “put off” by the explosive first taste of a fine Lambic, as subsequent sips tend to be mellower on the palate. Lambics are truly “strange brews” that don’t usually allow middle ground. Most people either love or hate them from the start. One thing is certain – no beer lover should miss the experience! Right: Dirk Lindeman serves up a Cuvee Renee unsweetened Gueuze in the Lindemans Brewery tasting room.